The adaptive immune system has evolved different types of immune responses against distinct pathogens. Thus, viruses and intracellular bacteria stimulate the generation of Th1 cells, which secrete IFN-γ, and activate macrophages to produce mediators such as NO and TNF, which kill the intracellular pathogen. In contrast, helminth parasites nearly always induce Th2 cells, the cytokines of which (IL-4, IL-13, and IL-5) induce IgE- and eosinophil-mediated destruction of the pathogen (1). Although there is much known about the cytokines that induce Th1 or Th2 responses, the decision-making mechanisms that determine the type of immune response against a given pathogen are poorly understood. Emerging evidence suggests that the type of response is a complex function of several determinants, including the dendritic cell (DC) 3 subset, the nature of the microbial stimuli, the local microenvironment, and cytokines (2, 3, 4). Thus, although different DC subsets may have some intrinsic potential to preferentially induce Th1 or Th2 responses (5, 6, 7), DCs also display considerable functional plasticity in response to signals from microbes and the local microenvironments. For example, CpG DNA induces IL-12p70 in DCs and elicits Th1 responses (8), whereas schistosome egg Ags (SEA) (9), certain forms of Candida albicans (10), or Porphyromonas gingivalis LPS (11) fail to induce IL-12p70 and stimulate Th2-like responses. The nature of the pathogen-recognition receptors, which enable DCs to sense such diverse stimuli, are only beginning to be understood. Recent efforts have focused on the Toll-like receptors (TLRs), which have broad specificity for conserved molecular patterns shared by large groups of pathogens (12, 13, 14). The expression of different TLRs on DCs enable them to discriminate between different stimuli. For example, Escherichia coli LPS signals through TLR4, zymosan, and peptidoglycans from Staphylococcus aureus signal through TLR2, the CpG-rich bacterial DNA signal through TLR9, and the bacterial flagellin signal through TLR5 (12, 13, 14). It has been suggested that signaling through any of the TLRs instructs DCs to preferentially stimulate Th1 responses (12). Although P. gingivalis LPS, a putative TLR2 agonist (15), favors Th2 responses (11), it is not clear whether this is a characteristic of all TLR2 agonists or simply a peculiarity of P. gingivalis LPS. If indeed signaling via different TLRs instructs DCs to elicit distinct Th responses, then the intracellular signaling pathways, which mediate such different outcomes, are not known. Here, we demonstrate that signaling via distinct TLRs conditions human monocyte-derived DCs to bias toward different Th responses via differential modulation of distinct components of the MAP kinase signaling pathway. Highly pure E. coli LPS (Ec.LPS; Ref.11) and flagellin (16) were provided by Drs. T. Van Dyke and A. Gewirtz, respectively. SEA was purified by Dr. B. Doughty (17). Pam3Cys-Ser-Lys4 (Pam3cys) (14) was purchased from Dr. G. Jung (Institute of Organic Chemistry, University of Tubingen, Tubingen, Germany). CD14+ monocytes were enriched from PBMC and cultured for 6 days with recombinant human GM-CSF at 100 ng/ml (PeproTech, Rocky Hills, NJ) plus recombinant human IL-4, at 20 ng/ml (PeproTech). At day 6, the cultures consisted uniformly of CD1a+CD14−HLA-DR+CD11c+ cells, which were negative for CD83. These immature DCs were pulsed with Ec.LPS (1 μg/ml), flagellin (0.5 μg/ml), Pam3cys (20 μg/ml), or SEA (100 μg/ml) for 48 h.
This was determined by flow cytometry using a FACSCalibur (BD PharMingen, San Diego, CA). Briefly, gated CD1a+CD14−CD11c+HLA-DR+ DCs were analyzed for the expression of CD80, CD86, CD83, and CD40 (BD PharMingen). This was measured by ELISA (BD PharMingen). For inhibition studies, DCs were incubated with commercially available (Calbiochem, La Jolla, CA) inhibitors of p38 (SB203580 (18), extracellular signal-regulated kinase (ERK) 1/2 (U0126-a specific inhibitor of MAP/ERK kinases 1 and 2 (18)), or c-Jun N-terminal kinase (JNK) 1/2 SP600125 (19)) for 1 h before adding the stimuli. At day 6, immature DCs were pulsed with Ec.LPS (1 μg/ml), flagellin (0.5 μg/ml), Pam3cys (20 μg/ml), or SEA (100 μg/ml) for 48 h and then washed and cultured at graded doses, with 105 FACS-sorted, naive CD4+CD45RA+CD45RO− T cells. After 5 days, T cell proliferation was assessed by overnight [3H]thymidine labeling. The secretion of Th1 and Th2 cytokines was assessed by ELISA. This was done with Western blotting or commercially available ELISA kits (BioSource International, Camarillo, CA). Briefly, on day 6, immature, human monocyte-derived DCs (2 × 106) were cultured for the indicated times, with various stimuli. ELISA were performed according to manufacturer’s instructions. For Western blotting, cellular extracts were prepared, as described in the BioSource ELISA Kit), and total protein (80–100 μg) was resolved on 10% SDS-PAGE gels and transferred to ImmunoBlot polyvinylidene difluoride membranes (Bio-Rad, Hercules, CA). Blotting was performed with anti-phospho-stress-activated protein kinase/JNK, p38, or ERK1/2 or anti-total stress-activated protein kinase/JNK, p38, or ERK1/2 Abs (New England Biolabs, Beverly, MA). Bands were visualized with secondary HRP-conjugated Ab and the SuperSignal West Pico Chemiluminescent Substrate (Pierce, Rockford, IL). The expression of total c-Fos, phosphorylated c-Fos, or phospho-ERK in DCs was determined by FACS using Abs directed against the two different forms of c-Fos (20). On day 6, human monocyte-derived DCs were stimulated for 0.25, 1, and 4 h with various stimuli. Cells were then fixed in 2% paraformaldehyde (10% ultrapure EM grade; Polysciences, Warrington, PA) for 10 min at 37°C. After a washing, permeabilization was done with freshly prepared 90% ice cold methanol for 30 min on ice. Then the cells were washed twice in staining buffer (3% FCS in PBS), labeled with a 1/100 dilution of c-Fas Ab (Santa Cruz Biotechnology, Santa Cruz, CA) or Abs against phospho-c-Fos, or phospho-ERK (BD PharMingen) for 30 min on ice, then washed in staining buffer, and labeled using FITC-labeled goat anti-rabbit Ig (BD Biosciences). Flow cytometry was done on FACSCaliber. Five target sequences of 21 nucleotide c-fos siRNA were selected from the web site (http://www.ambion.com/techlib/misc/siRNA_finder.html) for silencing the gene. The transcription of siRNA and transfection in DCs was done according to instructions from Ambion (Austin, TX). Briefly, cells were transfected by 20 nM siRNA using a siPORT lipid transfection protocol; after 6–7 h of transfection, cells were stimulated for 40 h and cytokine secretion was assayed by ELISA (BD Biosciences). To study the direct effects of different TLR agonists on the functional responses of DCs, uncommitted, immature human monocyte-derived DCs were cultured in the presence of predetermined concentrations of highly purified Ec.LPS (Ec.LPS-TLR4 stimulus), the synthetic TLR2 agonist Pam3cys, and highly purified flagellin (TLR5 stimulus). In addition, we cultured DCs with SEA, a classic Th2 stimulus. Although the receptor through which SEA signals is not definitively known, SEA was used as a positive control to induce Th2 responses. As a negative control, DCs were cultured in the absence of any stimulus. As shown in Fig. 1⇓a, all stimuli induced the maturation of DCs within 48 h, evidenced by the up-regulation of the costimulatory molecules, CD80 and CD86, although the induction of CD86 by Pam3cys and SEA was weaker than that by LPS and flagellin. CD80 induction by Pam3cys was also weaker. Most stimuli also induced the expression of the DC maturation marker, CD83. In the case of Pam3cys and SEA, the degree of maturation induced varied among different donors and was weaker than that induced by Ec.LPS or flagellin, as judged by the lower levels of CD83. Although all stimuli induced significant expression of the costimulatory molecules CD80 and CD86, both Pam3cys and SEA induced much lower levels of CD86. Different TLR ligands induce distinct DC responses. Immature, monocyte-derived DCs were cultured for 48 h with different microbial stimuli. DC responses were measured as follows. a, Flow cytometric analyses of the expression of the costimulatory molecules CD80 and CD86, and the maturation marker CD83. Blue, isotype; red, marker. b, Secretion of cytokines in the culture supernatants, measured was by ELISA. Each dot on the histograms represents a single donor. Representative of seven experiments. We next examined the secretion of cytokines by DCs in response to various doses of the different stimuli (data not shown). On the basis of this analysis, in all additional experiments, we chose doses of stimuli that triggered equivalent levels of IL-6 production at 48h, as indicated in Fig. 1⇑b. Interestingly, there were striking differences in the levels of the Th1-inducing cytokine IL-12p70, induced by the different stimuli. Ec.LPS and flagellin induced ∼1000 pg/ml of IL-12p70, but Pam3cys and SEA induced little or no IL-12p70 (Fig. 1⇑b). As indicated, the absolute amounts of cytokine secreted varied significantly from donor to donor, but the relative levels of the cytokines induced by the different stimuli were consistent. IL-10, a regulatory cytokine that is known to dampen both Th1 and Th2 responses in humans (6), was induced by Ec.LPS, flagellin, and Pam3cys, and at lower levels by SEA (Fig. 1⇑b). The proinflammatory cytokine TNF-α was strongly induced by Ec.LPS and flagellin but was induced at weaker levels by Pam3cys and SEA. Taken together, these data suggest that the different stimuli induce cytokine profiles distinct from those of DCs. In particular, Pam3cys and SEA induce little or no IL-12p70, relative to the TLR4 and TLR5 ligands. This impaired IL-12 induction was not a dose-related phenomenon, because even very high doses of Pam3cys and SEA, which induced high levels of CD83 on DCs (data not shown), did not induce IL-12p70. Given these differences in cytokine secretion, we wondered whether DCs stimulated with the various stimuli induce different types of Th responses. DCs cultured for 48 h with the various stimuli were washed and cultured, at graded doses, with naive, allogeneic, CD4+CD45RA+CD45RO− T cells. After 5 days, the cultures were pulsed with [3H]thymidine) for 12 h to measure the proliferation of T cells. As seen in Fig. 2⇓a, in all cases, DCs induced efficient proliferation of T cells. The Th cytokines secreted in culture was determined by cytokine ELISA (Fig. 2⇓b). 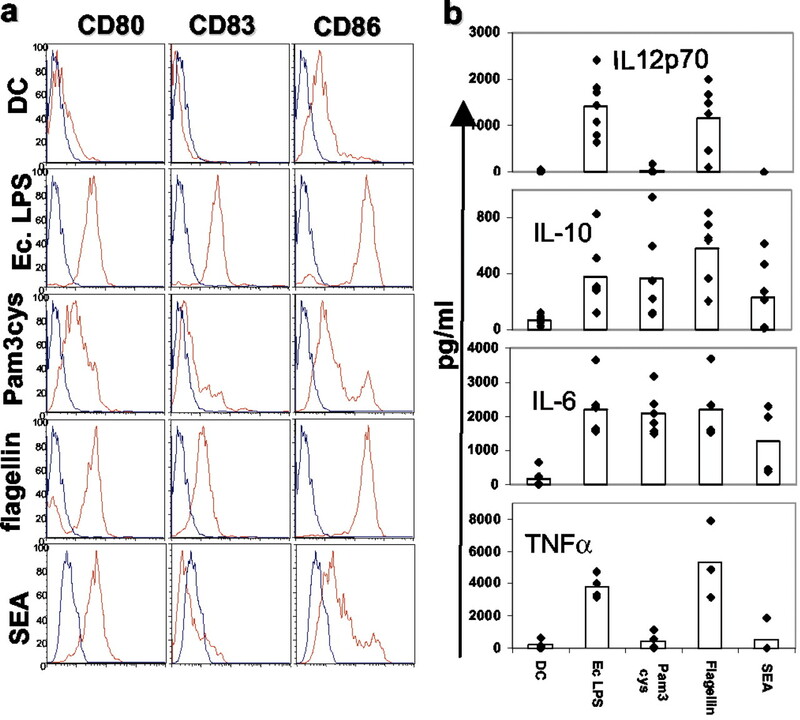 DCs cultured in the absence of any stimuli induced <1000 pg/ml of the Th1 cytokine IFN-γ, and 300–400 pg/ml of the Th2 cytokines IL-5 and IL-13, this profile being consistent with a Th0 response. However, DCs stimulated with Ec.LPS or flagellin induced ∼4000 pg/ml IFN-γ and much lower levels of IL-5 and IL-13, a typical Th1 profile, this being consistent with the high levels of IL-12p70 induced by these stimuli (Fig. 1⇑a). In contrast, DCs stimulated with Pam3cys or SEA biased the response toward the Th2 pathway. In particular, SEA induced a Th2 response, with <300 pg/ml IFN-γ (less than uncommitted DCs), but 800 pg/ml IL-5, and 800 pg/ml IL-13. Pam3cys induced ∼2000 pg/ml IFN-γ and high levels of IL-5 (600 pg/ml) and IL-13 (600 pg/ml). Interestingly, IL-4 could not be detected in any of the cultures, even with SEA, a classic Th2 stimulus, and even after restimulation of the T cells with anti-CD3 + anti-CD28, or PMA + ionomycin (data not shown). This is consistent with numerous other studies with human DCs (2, 3, 4, 7), in which classical Th2 responses have always been difficult to obtain in vitro. Nevertheless, these data suggest that TLR4 and TLR5 ligands induce uncommitted DCs to adopt a Th1-inducing mode, but Pam3cys and SEA induce DCs that skew the response toward the Th2 end of the spectrum. This is underscored by the ratios of IFN-γ to IL-5 or IFN-γ to IL-13, which reflect the Th1/Th2 balance (Fig. 2⇓c). Although Ec.LPS and flagellin favor Th1 responses, Pam3cys and SEA clearly tilt the balance toward Th2 responses (Fig. 2⇓b). This was not a dose-related phenomenon, because even very high doses of Pam3cys and SEA, which induced high levels of CD83 on DCs (data not shown), did not induce Th1 responses. DCs activated with different TLR ligands stimulate distinct Th responses. Immature, monocyte-derived DCs were cultured, for 48 h with different microbial stimuli, including various TLR ligands. Then, the DCs were washed and cultured at graded doses with 105 naive, allogeneic CD4+ T cells. a, After 5 days, the T cell proliferation was assessed by overnight [3H]thymidine labeling. ▪, 104 DCs; □, 2 × 103 DCs; and ▧, 0 DCs. b, The secretion of Th1 and Th2 cytokines in culture was assessed by ELISA. c, The ratios of Th1 to Th2 cytokines were evaluated for each of the stimuli. Representative of seven experiments. Do Ec.LPS and flagellin induce Th1 responses via an IL-12p70 mechanism? In all cases, IFN-γ secretion was diminished, when a neutralizing Ab against IL-12 was used (data not shown). Taken together, the present data suggest that TLR4 and TLR5 ligands induce Th1 responses via IL-12p70, but TLR2 ligands or SEA induce Th2/Th0 responses, possibly via a default mechanism that fails to induce IL-12p70. To gain insights into the potential intracellular signaling mechanisms that may mediate the different DC responses, we focused on the MAP kinase signaling pathway, one of the most ancient signal transduction pathways in mammalian cells (21). MAP kinases consist of three major groups, p38 MAP kinases, the ERK1/2, and JNK1/2 (21). Previous reports indicate a critical role for MAP kinases in regulating Th1/Th2 balance in T cells (21), and emerging evidence suggests a role for these proteins in regulating cytokine production from APCs (18). We therefore sought to determine the phosphorylation of p38, ERK1/2, and JNK1/2 in DCs stimulated with various stimuli. As shown in Fig. 3⇓a, there were differences in the magnitude and duration of phosphorylation of the MAP kinases induced by the different stimuli. Ec.LPS, flagellin, and Pam3cys induced enhanced phosphorylation of p38 MAP kinase, relative to unstimulated DCs, although there were some subtle differences in the duration of phosphorylation. Ec.LPS, and flagellin induced enhanced duration of p38 phosphorylation, whereas Pam3cys did not (Fig. 3⇓a). SEA was a very weak inducer of p38. In the case of ERK1/2 phosphorylation, however, Pam3cys induced a much higher magnitude and duration of phosphorylation (which was sustained even at 4h; Fig. 3⇓, a and b), compared with Ec.LPS and flagellin. SEA also induced ERK1/2 phosphorylation, which although weaker than that induced by Pam3cys, was sustained at 4 h at levels significantly higher than background levels (up to 4-fold above baseline levels; Fig. 3⇓, a and b). In contrast, Ec.LPS barely induces ERK phosphorylation above background levels and gives at best a 2-fold increase. Importantly, the ratios of p38 to ERK phosphorylation were much higher with Ec.LPS and flagellin stimulation than in the other groups (Fig. 3⇓a). We also examined the phosphorylation of JNK1/2 induced by the various stimuli. As shown in Fig. 3⇓c, stimulation with Ec.LPS and flagellin induced higher levels of JNK 2 than stimulation with Pam3cys and SEA; however, induction of JNK1 was more complex; whereas flagellin induced high levels, Ec.LPS, Pam3cys, and SEA were very weak. The biological significance of this differential induction of JNK1/2 is presently under study. Therefore, distinct TLR ligands induce differences in the magnitude and duration of signaling of MAP-kinases in DCs. Distinct TLR ligands differentially stimulate ERK and JNK signaling, which regulate IL-12p70 and IL-10. Day 6 DCs were cultured with different microbial stimuli for 0 min (□), 0.25 h (▪), 1 h (▦), and 4 h (◼). a, At each time point, the expression of phosphorylated and total ERK was evaluated by ELISA. Data are presented as the fold increases in the phosphorylated to total protein ratios, relative to the 0-min value. b, Flow cytometric analyses of phospho-ERK expression in DCs. ·····, Staining in unstimulated DCs; ——, staining after stimulation. c, Expression of JNK1, JNK2, and total JNK was determined by Western blot analysis. d, The effect of blocking p38 or JNK1/2 on IL-12p70 secretion. IL-12p70 levels, after blocking with inhibitors, are expressed as a percentage of levels without inhibitor (which is 100%). Representative of five experiments. What roles do p38, JNK1/2, and ERK1/2 play in IL-12p70 induction by DCs? We addressed this question using the well-characterized, highly selective, synthetic inhibitors of p38 (SB203580; Ref.18), ERK1/2 (U0126, a specific inhibitor of the upstream activators of MAP kinase kinase 1 and 2; Ref.18), or JNK1/2 (SP600125; Ref.19). Blocking p38 or JNK1/2 largely abrogated IL-12p70 production induced by Ec.LPS and flagellin (Fig. 3⇑d). IL-12p70 levels, after blocking with inhibitors, are expressed as a percentage of levels without inhibitor (which is 100%). At 10 h, Pam3cys did not induce any IL-12; thus, the value is 0%. At 24 h, Pam3cys induced 20–100 pg/ml IL-12, and this is considered to be 100%. 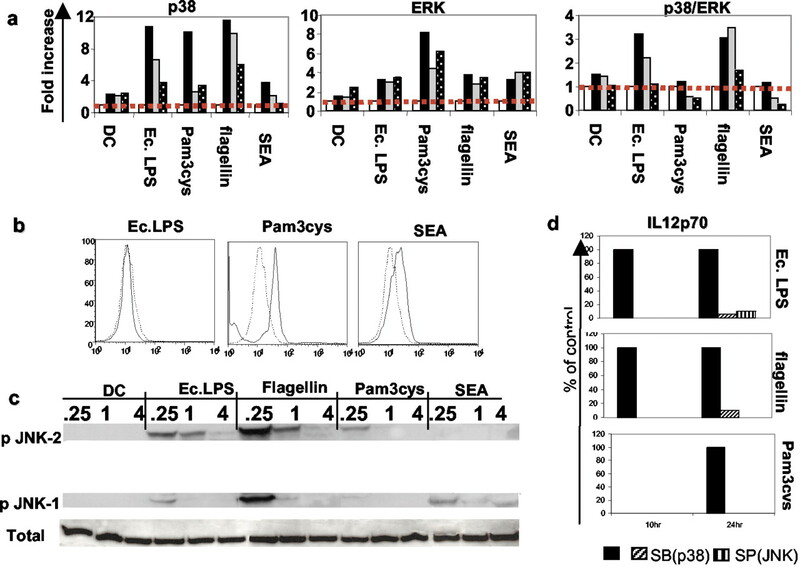 Interestingly, blocking ERK1/2 activity significantly enhanced IL-12p70 production induced by flagellin, Pam3cys, and Ec.LPS, suggesting an important role for ERK1/2 in the negative regulation of IL-12p70 production (Table I⇓). Despite the donor-to-donor variation, as indicated in Table I⇓, there was a general trend for ERK inhibition to enhance IL-12, consistent with previous reports (18). In the case of SEA, blocking ERK1/2 did not result in consistent increases in IL-12p70, suggesting that additional mechanisms regulate the suppression of IL-12p70 by SEA. Taken together, these data suggest that TLR4 and TLR5 agonists preferentially induce IL-12p70 via a mechanism involving p38 and JNK1/2 phosphorylation. In contrast, Pam3cys and SEA induce enhanced duration or magnitude of ERK1/2 phosphorylation, a negative regulator of IL-12p70. How does the enhanced ERK1/2 signaling result in suppression of IL-12p70? Recent work from one of our laboratories (20) suggests that sustained ERK signaling results in the phosphorylation and stabilization of the immediate early gene product c-Fos in a fibroblast cell line. Thus, we determined the kinetics and magnitude of expression off both total c-Fos and phosphorylated c-Fos in DCs stimulated with the various stimuli, using Abs directed against the two different forms of c-Fos. In Fig. 4⇓a, the blue histograms represent expression levels in unstimulated, immature DCs, and the red histograms represent expression levels after stimulation with various stimuli. As observed, all stimuli induced enhanced levels of c-Fos expression, relative to unstimulated DCs, and this c-Fos expression peaked after 2 h of stimulation. However, at this time point, the level of expression of total c-Fos (as assessed by the mean fluorescence intensity of staining), and fraction of cells expressing c-Fos, in DCs stimulated by Pam3cys or SEA is much greater than in DCs stimulated with Ec.LPS or flagellin. Consistent with this, the more stable, phosphorylated c-Fos was not expressed in DCs stimulated with flagellin and Ec.LPS but was expressed at significant levels in DCs stimulated with Pam3cys and SEA (Fig. 4⇓a). Furthermore, c-Fos expression was maintained even at 4 h in DCs stimulated with Pam3cys or SEA, but not with Ec.LPS or flagellin (data not shown). Therefore, stimulation of DCs by Pam3cys and SEA, which induce sustained duration of ERK1/2 signaling, result in the phosphorylation and stabilization of c-Fos. What role, if any, does c-Fos play in the regulation of IL-12p70? We addressed this using the RNA interference (siRNA) technique (22), to inhibit c-Fos expression in DCs. Five target sequences of 21 nucleotide si-RNA designed to target the c-fos gene were selected from the Ambion website (http://www.ambion.com/techlib/misc/siRNA_finder.html). The transcription of siRNA and transfection in dendritic cells was done per instructions from the the Ambion kits. siRNA targeting the c-fos gene decreased the amount of corresponding protein (data not shown), but did not lower DC viability. 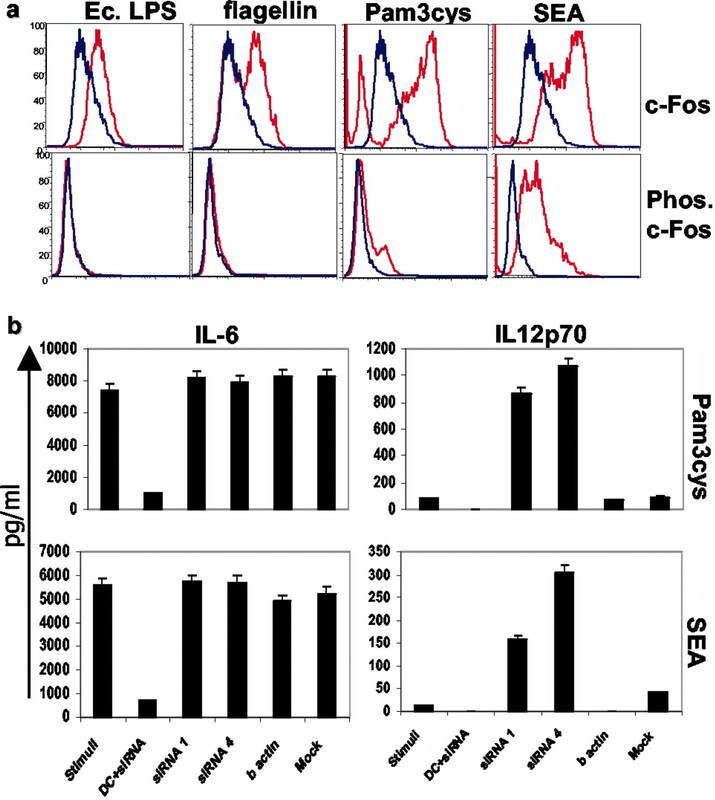 The induction of a neutral cytokine such as IL-6 appeared to be unaffected by the reduction on c-Fos (Fig. 4⇓b). However, there was a profound enhancement of IL-12p70 induction in response to Pam3cys or SEA (Fig. 4⇓b). There was a similar, although much less profound enhancement with LPS and flagellin (data not shown). Strikingly, when c-fos activity is impaired, even a classic Th2 stimulus, such as SEA, induces abundant IL-12p70 and thus behaves as a Th1 stimulus. Taken together, these data suggest that c-Fos plays a important role in the negative regulation of IL-12p70, and that stimuli such as Pam3cys and SEA, which appear to bias the Th response toward the Th2 pathway, induce enhanced levels of c-Fos expression in DCs. Distinct TLR ligands differentially induce c-Fos, which regulates the production of IL-12p70. a, Flow cytometric analyses of the expression of total c-Fos and phosphorylated c-Fos (Phos. c-Fos) in DCs stimulated with different stimuli. Blue histograms indicate expression levels on unstimulated DCs, and red histograms represent expression after stimulation. b, Inhibition of c-fos by siRNA does not affect IL-6 induction in DCs in response to Pam3cys and SEA. c, However, this siRNA results in a striking increase in the secretion of IL-12p70, in response to Pam3cys and SEA. Stimuli, DC + stimulus; DC + siRNA, DCs cultured with siRNA, without any stimulus; siRNA 1, 4 and b-actin, are DCs cultured with the respective siRNAs, and then stimulated; mock, mock transfected DCs. In summary, our present data suggest: 1) that activation of DCs via TLRs do not always result in Th1 responses (12, 23) but can also induce skew toward Th2 responses; 2) a possible mechanism involving differential modulation of the threshold and duration of MAP kinase signaling, which may mediate the distinct DC responses triggered by the different TLR ligands; 3) fundamental differences in the phosphorylation and stabilization of the early growth transcription factor c-Fos, which is phosphorylated and stabilized by enhanced ERK1/2 signaling (20). Taken together, these data suggest an important role for c-Fos in regulating IL-12p70 production within DCs. c-Fos belongs to the AP-1 family of transcription factors, (20). These data are consistent with an emerging paradigm and suggest that signaling via distinct TLRs triggers qualitatively different responses from the innate immune system (3, 11, 24, 25, 26). This underscores novel therapeutic opportunities that will be gained by modulating TLRs, MAP kinases, or early growth transcription factors, to manipulate adaptive immunity in the immune therapy of allergy, autoimmunity, transplantation, and cancer. We thank Mike Hulsey for outstanding assistance with flow cytometry and warmly acknowledge the support and advice of Rafi Ahmed and Anthony Sandoz (Centers for Disease Control and Prevention, Atlanta, GA). ↵1 This work was supported by National Institutes of Health Grants RO1 DK 57665-01, RO1 AI 48638-01, and RO1 AI056499-01 (to B.P. ), and DE1391 (to T.V.D.). ↵3 Abbreviations used in this paper: DC, dendritic cell; SEA, schistosome egg Ags; TLR, Toll-like receptor; MAP kinase, mitogen-activated protein kinase; ERK, extracellular signal-regulated kinase; JNK, c-Jun N-terminal kinase; siRNA, small interfering RNA; Ec.LPS, Escherichia coli LPS; Pam3Cys, Pam3Cys-Ser-Lys4. Maldonado-Lopez, R., T. De Smedt, P. Michel, J. Godfroid, J., B. Pajak, C. Heirman, K. Thielemans, O. Leo, J. Urbain, and M. Moser. 1999. CD8α+ and CD8α− subclasses of dendritic cells direct the development of distinct T helper cells in vivo. J. Exp. Med. 189:587. MacDonald, AS, A. D. Straw, B. Bauman, E. J. Pearce. 2001. CD8− dendritic cell activation status plays an integral role in influencing Th2 response development. J. Immunol. 167:1982. Pulendran, B., P. Kumar, C. W. Cutler, M. Mohamadzedah, T. Van Dyke, J. Banchereau. 2001. Lipopolysaccharides from distinct pathogens induce different classes of immune responses in vivo. J. Immunol. 167:5067. Medzhitov, R., C. Janeway, Jr. 2000. Innate immune recognition: mechanisms and pathways. Immunol. Rev. 173:89. Hirschfeld, M., J. J. Weis, V. Toshchakov, C. A. Salkowski, M. J. Cody, N. Ward, D. C. Qureshi, S. M. Michalek, S. N. Vogel. 2001. Signaling by Toll-like receptor 2 and 4 agonists results in differential gene expression in murine macrophages. Infect. Immun. 69:1477. McSorley, S. J., B. D. Ehst, Y. Yu, A. T. Gewirtz. 2002. Bacterial flagellin is an effective adjuvant for CD4+ T cells in vivo. J. Immunol. 169:3914. Moyes, R. B., L. F. Alves-Oliveira, J. C. Parra, G. Gazzinelli, B. L. Doughty. 1996. HPLC fractionated soluble egg antigen from Schistosoma mansoni elicits a heterogeneous human immune response. Parasite Immunol. 18:625. Park, J. M., F. R. Greten, Z. W. Li, M. Karin. 2002. Macrophage apoptosis by anthrax lethal factor through p38 MAP kinase inhibition. Science 297:2048. Dykxhoorn, D. M., C. D. Novina, P. Sharp. 2003. Killing the messenger: short RNAs that silence gene expression. Nat. Rev. Mol. Cell. Biol. 4:457. Toshchakov, V., B. W. Jones, P. Y. Perera, K. Thomas, M. J. Cody, S. Zhang, B. R. Williams, J. Major, T. A. Hamilton, M. J. Fenton, S. N. Vogel. 2002. TLR4, but not TLR2, mediates IFN-β-induced STAT1α/-b-dependent gene expression in macrophages. Nat. Immunol. 4:392.